Jeffrey Johnson, CEO of Iowa Premium Beef and Governor Terry Branstad. 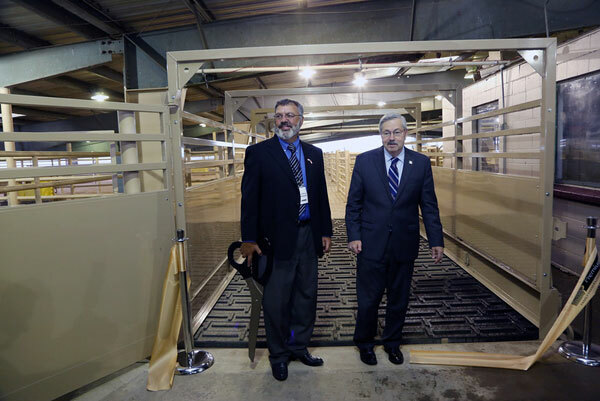 State and local officials held a ribbon cutting ceremony Thursday for the Iowa Premium Beef newly renovated Tama beef processing facility. Tama Mayor Dan Zimmerman says the plant will process Black Angus beef. “The opening of Iowa Premium Beef represents the beginning of a dynamic economic growth period for the Tama community and the state of Iowa,” Zimmerman says. He says the plant also has room for future expansion. “This facility has the potential to add over 300 additional workers — when operating at maximum production levels — for a total of over a thousand jobs. Jobs that we need here in Tama,” according to Zimmerman. The mayor says the impact of the plant will go beyond the city. “At peak production this facility will have the capacity to process 2,000 head of cattle each day. Needless to say, this will provide a shot of adrenaline to our state’s cattle market,” Zimmerman says. Iowa Premium Beef says the vast majority of the cattle processed at the plan will come from within 150 miles of Tama.